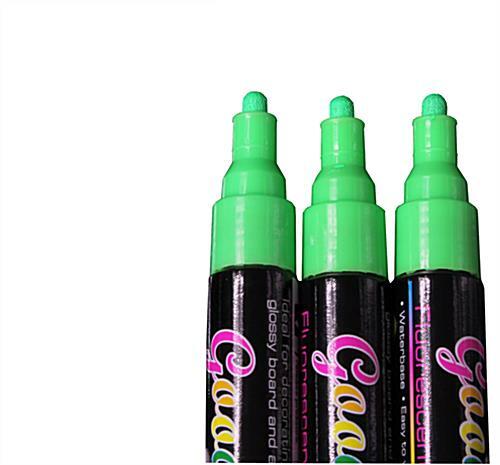 Fluorescent green liquid chalk flows evenly & dries quickly for a bright presentation. Chalkboard pens are sold in sets of (3) for convenience. Writing cleans easily with a damp cloth for updating messages quickly. 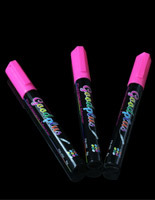 These chalkboard pens are great for advertising in a variety of businesses. 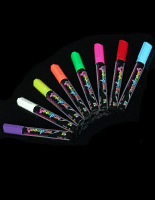 Some of the many places that use these bright sticks are restaurants, classrooms, retail stores, and many more. 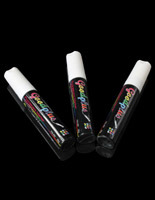 Chalkboard pens for business use are designed for non-porous surfaces. Glass, windows, and glossy boards are just a sample of the many non-porous surfaces that these markers work on. In addition, chalkboard pens, called wet erase writing tools, are often used on LED write-on signs. The light up display gives the advertisements a captivating shining effect. These neon green chalkboard pens clean easily. Customers just need to wipe the messages with a damp cloth. These wet erase markers are chalkboard pens that have a small tip. The 1/16" point is ideal for drawings and writing messages. These chalkboard pens dry fast so there is not a runny effect. 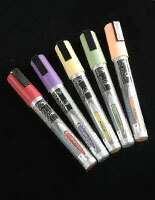 In addition, unlike traditional chalk these markers do not leave a dusty residue on the writing boards. 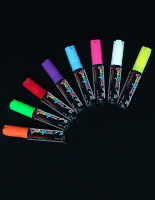 These bright sticks are chalkboard pens that are non-toxic. These markers are also water based so they are safe for home or business use. These wet erase writing tools are chalkboard pens that are affordable. 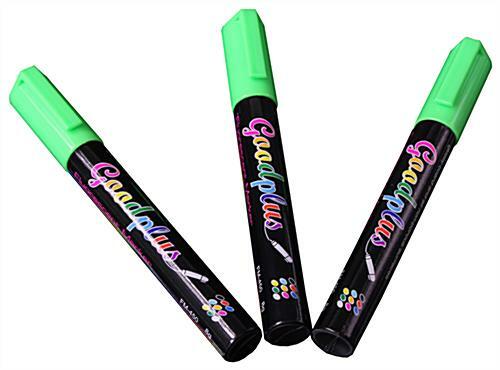 This neon green marker is sold in a pack of 3 at a great price. Consumers do not need to be concerned with running out of ink since there are spares or they can place them in different areas of the business or classrooms.